Romanian festival Untold has firmly established itself as one of the world’s most exciting festivals for electronic music, with a seldom-seen level of production that makes it as spectacular visually as it is aurally. Now with their first epic line-up announcement for their 2018 edition (2-5 August in Cluj, Romania), the festival otherwise known as ‘World Capital Of Night & Magic’ are laying down another marker about their intention to bolster the reputation further still. 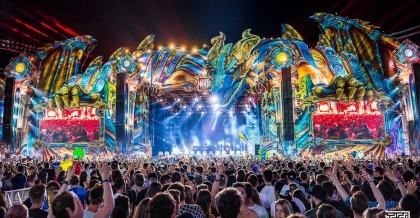 The formidable main stage features headliners from Europe and the US, with the Dutch represented by Afrojack‘s hard-edged sounds and Armin Van Buuren‘s euphoric tones. Norwegian superstar Kygo brings his blissed-out vibes, Diplo and Steve Aoki will thump it out like only they know how and Belgium’s Dimitri Vegas & Like Mike bring their killer drops and epic riffs. Electronic royalty The Prodigy will show why they’re one of the greatest live acts of all time, while the acclaimed Bonobo is the second live headliner. Alesso and Oliver Heldens also join on the main stage, making for a truly spectacular first bunch of artists on the 2018 line-up. Finally the bass-fuelled Alchemy Stage will rock to the sounds of drum & bass king Andy C, the nasty beats of Dub FX and Flux Pavilion‘s razor-sharp basslines. Modestep bring their high-octane live/DJ hybrid show, with further DJ sets from scene legends Noisia and Pendulum and man-on-the-moment, Wilkinson. Over 70,000 festival-goers attended last year’s four-day event, with amazing praise from the acts who played.